Adidas has taken the wraps off the Nitrocharge, a new kind of football boot for what it describes as "the engine player". 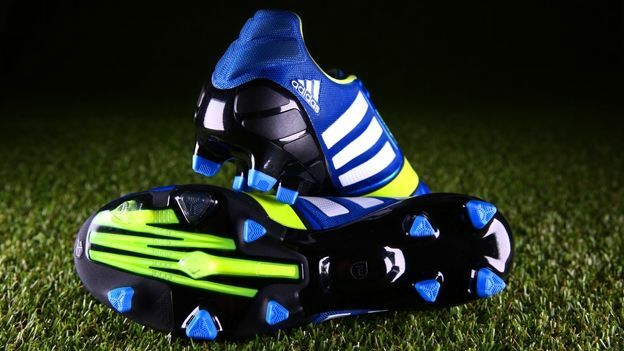 According to Adidas, the Nitrocharge stores and releases energy, providing players with an extra boost when needed through two new technologies; the ENERGYSLING and ENERGYPULSE. The new player type, it claims, was discovered through research with Opta, specialists in live sports data. Adidas described the engine as the "first on the team sheet; always running, tackling and powering his team; he is relentless in his pursuit of chances from box-to-box for the full 90 minutes. "This player is epitomised in the Nitrocharge adverts with high octane action, fast-paced effort and a no-nonsense attitude in order to outline the sort of player this boot has been designed for." Among the players signed up to promote the new boots are Daniele De Rossi (A.S. Roma), Dani Alves (Barcelona), Ezequiel Lavezzi (Paris Saint Germain) and UEFA Champions League Finalist Javi Martinez (FC Bayern Munich). ENERGYSLING, Adidas says, is a supporting sidecut and turn movement that helps players sharpen their reactions on the pitch. The ENERGYPULSE on the other hand (or foot) is inspired by spring technology. Adidas claims that it provides "premium energy" during the toe-off phase when sprinting. The new builds upon Adidas' previous innovations including the Predator, Adipure, and F50 ranges. The Nitrocharge also features a protection mesh layer around the foot and protection pads around what Adidas describes as the most sensitive tack zones such as the Achillies tendon. It is also compatible with Adidas' miCoach speedcell technology. The Adidas Nitrocharge will be available from June in two colours: beautiful blue and running white. Looking for new football boots? Check out T3's roundup of the best football boots on the market.